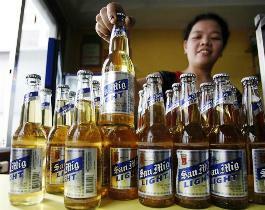 The Philippine conglomerate may be mulling a sale or listing of its brewing arm. That puts Kirin under pressure to buy the 51 pct it doesn’t already own or risk losing a key part of its Asian business to a rival. It could prove expensive, as the Dutch brewer found last year. San Miguel set a new record for ECM issuance in the Philippines last week with its US$900m fundraising. But praise was in short supply as an ambitious target, confused story and sloppy execution combined to make the equity issue a flop that had to be rescued by an investor-friendly convertible. San Miguel Corp. is looking to list San Miguel Brewery (SMB) on Manila’s stock exchange within the next six months, according to a Nov. 6 report by the Philippine Daily Inquirer citing the company’s president Ramon Ang. The Philippine conglomerate owns 51 percent of the business with the rest held by Japan’s Kirin Holdings. Kirin would be interested in buying the rest of the business that it doesn’t already own if it is approached, Bloomberg reported on Nov. 1, citing people familiar with the situation. A valuation of about 20 times earnings before interest, taxes, depreciation and amortization is now “normal” for deals in the industry, Ang said in a text message to the news wire on the same day. Ang said on Oct. 29 that “several parties” have approached the company about buying its majority stake in the Philippines’ biggest brewer. Ang said at the time that the business was not for sale. Kirin acquired a 48.4 percent stake in of SMB in 2009 by buying 43.2 percent from San Miguel Corp. and the remaining 5.1 percent from public shareholders. The total cost was around 65.8 billion pesos or less than $1.4 billion based on the exchange rate at the time. The following year SMB bought the international beer and malt-based beverage business of San Miguel Corp. which has operations in Hong Kong, Indonesia, mainland China, and Vietnam. International operations accounted for 19 percent of SMB revenues as of Dec. 31, 2012.